Don't spend $495, $695, $895, or more, plus two, three, or more days away from the job, plus airfare, travel time, and lodging expense, for a complete, quality "Project Management" seminar. 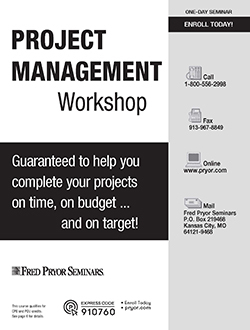 Pryor Learning Solutions now brings directly to your area the first ever, one-day Project Management training seminar. 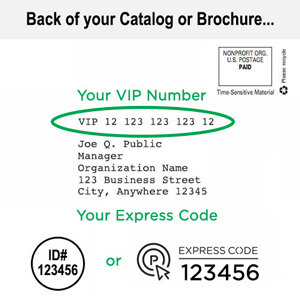 Here's what it means to you … no costly travel time and at a fraction of what other project management programs cost. Master the art of project planning, and organize your project without omissions, mistakes or miscalculations. Use better communications techniques to get the cooperation, support and resources that are vital to the project's success. Root out waste in every stage of the project — wasted time, money and effort that endanger a project's success. Identify and use indispensable planning and scheduling tools that assure the project is implemented exactly as planned. Estimate time and costs with pinpoint accuracy, using a simple three point approach that reduces the risk of costly delays and errors. Your desk has become a mountain of paperwork, progress is moving at a snail’s pace, your team seems unmotivated and you realize your initial estimate for resources is only going to cover half of your expenses. As a project manager, you are charged with major decision-making, monitoring quality control and leading your project team toward the final goal. You have a lot of responsibility to juggle and the ultimate success or failure of the project is a direct reflection of your ability to organize, execute and lead. Sound overwhelming? Don’t worry, you’re not alone and we have the tools to help! Interpret the five key traits of the most successful project managers and determine your own personal strengths and weaknesses. Discover the five-point success blueprint of expert project managers and why some project managers are far more effective than others. Remove the mystery and complexity from on-time/on-budget performance: insightful tips from master project planners you can use every day. Are you a full-time project manager or do you have other responsibilities? Understand the benefits and drawbacks of both situations and learn new ways to be more effective, regardless of your role. Steer your project around the lethal traps of office politics with our six-step model for success. Analyze the structure and makeup of your project team for more precise planning. Avoid delays and scheduling problems by assessing each team member’s physical location, roles and responsibilities. Identify the specific skills you need as the project’s manager by defining and understanding the unique organization of your team. Employ dynamic management team-building techniques to improve productivity and performance from project start to finish. Utilize a step-by-step checklist to define specific project objectives and pinpoint essential planning components. Identify the specific people you should involve in setting objectives, and ensure the project receives necessary support and resources. Communicate the project’s goals and objectives so everyone involved is working on the same project, schedule and budget. Organize even the most complex project into manageable, measurable chunks of activity. Follow fail-safe planning formulas that put first things first and avoid scheduling conflicts later in the project. Implement specific methods to leverage project tasks so multiple actions and activities can be completed smoothly and in tandem. Demystify professional planning models: how to simplify every kind of project with PERT, CPM and Gantt charting techniques. Utilize eight professional hints to better estimate time requirements and stop bottlenecks and delays before they can start. An expert guide to cost estimation: Use a simple, easy-to-follow approach to increase accuracy and reduce the risk of costly errors. Take innovative steps to help you marshal all the resources available by evaluation of the “Big 4” resource areas. Analyze your resources to determine what you already have available and what additional resources you must arrange before the project is under way. Allocate your resources wisely and avoid wasting time or money at any stage of the project. Utilize the flexible three-phase “loop concept” to keep your project flowing smoothly every step of the way. Know specific ways to build and sustain commitment to projects over the long haul — from the project team through top management. Learn the two key skills to help you anticipate problems before they become difficult to solve. Master the art of progressive decision making: how to keep the project moving on track with no-stall decision-making tactics. Hold action-oriented meetings focusing on results; plus, a little-known technique to ensure successful team meetings. Determine the essentials of project control and use these principles to keep your project on time, on budget and meeting objectives. Document and report: How to communicate the progress of your project to team members and management. Increase your communication effectiveness with innovative graphic techniques for effective, concise progress reports. Build flexibility into project implementation, allowing you to handle opportunities and problems as they arise. Avoid insidious “schedule slippage” by understanding the causes and utilizing expedient solutions. Prepare for Murphy’s Law: how to overcome — even take advantage of — the inevitable changes in timing and resources. Maximize your performance with professional recommendations. Recognize the four key advantages of computers and the three dangers you must avoid. Utilize a simple seven-step evaluation to determine whether the use of computers will significantly benefit your project. Use a six-step checklist to evaluate computer software options and zero in on the best software solution for your project. Employ a quick-analysis method to pinpoint your project’s specific requirements in hardware and software.